Stepping into Trader Vic’s at the new L.A. LIVE near the Staple Center is like being transported back into the 1940s. It’s Polynesian decor, music, and food will entice you to unwind, close your eyes and pretend you are in an upscale restaurant in Samoa or Fiji. The bar area offers live music on Friday and Saturday evenings and fruity libations in colorful glasses. Extra large punch drinks can be shared with four friends sipping straws from the same bowl. I’m sure when the downtown working professionals leave their desk in the evening, they stop by Trader Vic’s for a Pupu platter and a Tiki Bowl or Navy Grog. It all started in 1934, when Victor Bergerton mixed drinks up in the Oakland area at the saloon, Hinky Dinks. He dreamed of traveling to the South Seas to see the exotic ladies, taste the unique foods and swim in the warm water. 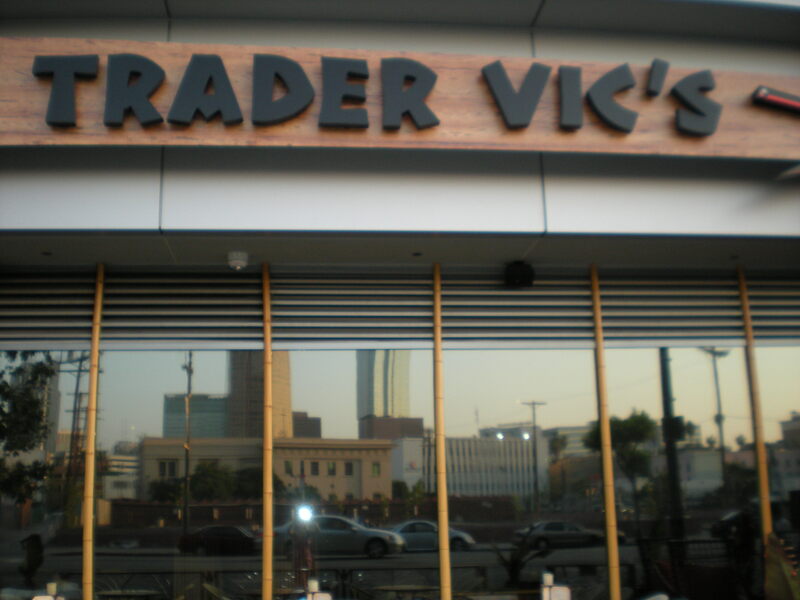 When he returned home, he wanted to share the flavors, design and culture with others, so he opened his first Trader Vic’s. Today there are 26 locations across the world with 10 locations in the United States (4 in California),2 in Europe, 10 in the Middle East and 4 in Asia.Our South Seas experience started with friendly servers and a basket of warm Taro bread, water crackers, and homemade peanut butter with coconut cream. WOW! That’s different from the traditional bread basket and more fun to eat. 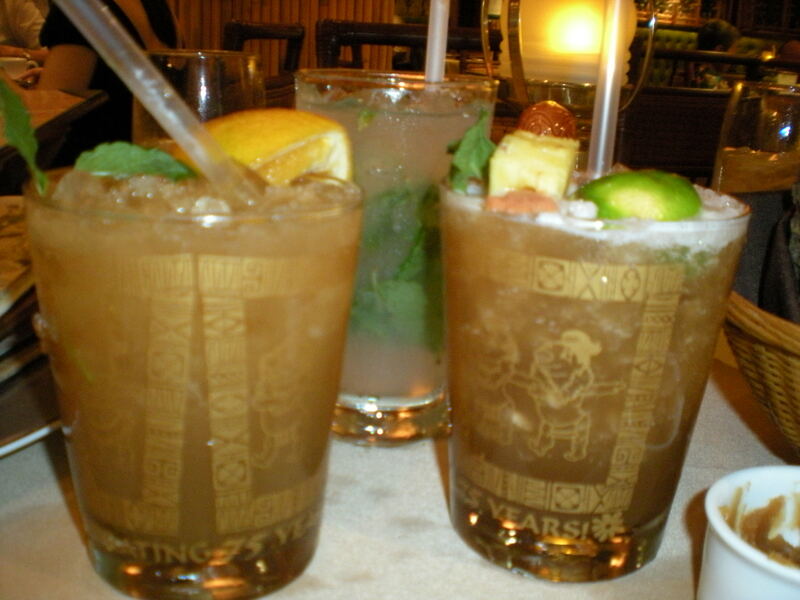 We ordered the Trader Vic’s own punch and Trader Vic’s Mai Tai. Our daughter tried the Soft Mojoito from the non-alcoholic menu. Next our waiter recommended we order the Cosmo Tidbits. 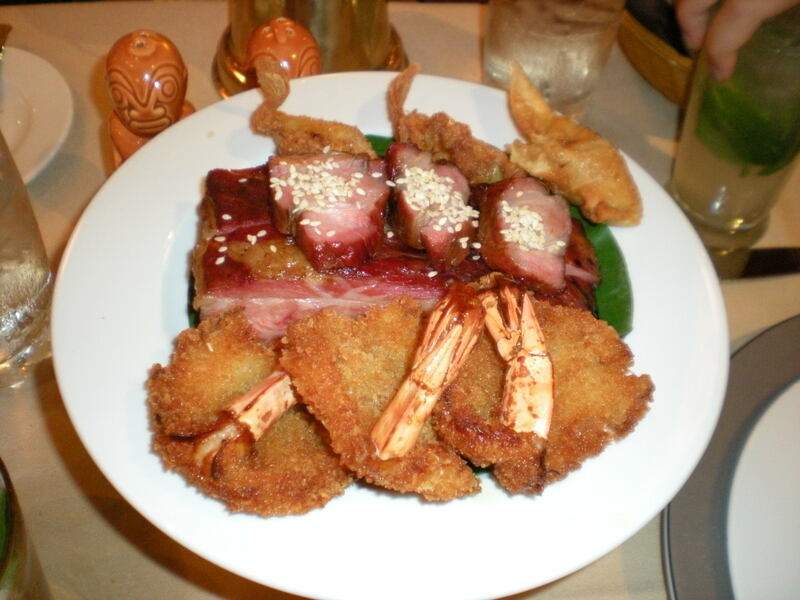 Its a combination of appetizers; Spareribs (flavorful, but too tough and chewy), crab rangoon (like a wonton), delicious crispy prawns and pieces of pork. It arrived with individual butterfly dishes with ketchup on one wing and spicy mustard on the other. For entrees we decided to order the Sea Bass cooked in the Chinese wood fired oven, traced back to the Han Dynasty (206 BC to AD 20). Meats are cooked by the heat of the oven, not fire. The American Heart Association approves this type of cooking. The fish is served in a delicious Miso sauce. We loved it. Our daughter order the Crispy Duck that was prepared at our table. Our waiter brought 1/2 a duck, moo shu pancakes, scallion, cucumbers, and hoisin sauce. It was delicious. I selected the BBQ veggie and Tofu Curry from the Trader Vic’s Curry selection. What a colorful presentation! The curry was a combination of potatoes, carrots, cucumbers, apples, red pimentos, onions and Trader Vic’s own blend of madras curry powder. It had a KICK, however I softened the taste with the tray of sunflower seeds, currants, cucumber, banana, coconut, chutney, chow-chow and tomatoes.For dessert we had the sampler with four satisfying sweet tooth treats; a Polynesian snowball (vanilla ice cream rolled in coconut with pecans and bittersweet chocolate sauce), Tahitian coffee creme brulee, Chocolate kumquat spring roll and a scrumptious cheesecake. A perfect ending to a South Sea dining adventure. For reservations call (213) 785-3330. Trader Vic’s is located at 800 West Olympic Blvd. # A120, Los Angeles, CA 90015.